The tutorial is an introduction to TreeDyn, which organize graphical functions into 8 families : Navigation, Figuration, Annotation, Identification, Conformation, Abstraction, Reflection and Illustration. There is 3 more groups called Import/Export, Scripting and Library. The tutorial #01 give examples on how to use several functions from these families, either by using tools represented by icons and are useable "on the fly" to the graphic elements and by using contextual menus linked to graphicals items. Once you have loaded a tree, you can access each step of the tutorial independantly from the others. CM tree (M3 near a tree), Navigation menu, "Resize..."
set new width and height values, then clic "Apply"
Main TreeDyn Panel / View Menu / command "Parameters Panel (Color/Font/Stipple/Symbol/Text)"
setting a new foreground color to an internal node will erase all the foreground color of the sub-internal nodes. M3 on the first background then select the command "Update color"
Parameters Panel / Text tab / If the "Tabulation" checkbox is "on", annotations sets will be tabulated automatically. You can use the "preview" button for knowing where annotations will be inserted. Use the "+" and "-" buttons for manual tabulations. Parameters Panel / Symbol tab / If the "Tabulation" checkbox is "on", annotations sets will be tabulated automatically. You can use the "preview" button for knowing where annotations will be inserted. Use the "+" and "-" buttons for manual tabulations. 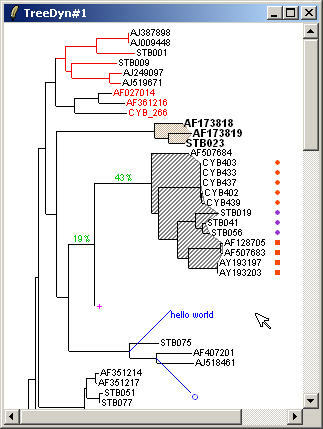 CM Tree / "Display Newick Annotations"
Select a tree configuration, for instance "Circular with branch length"